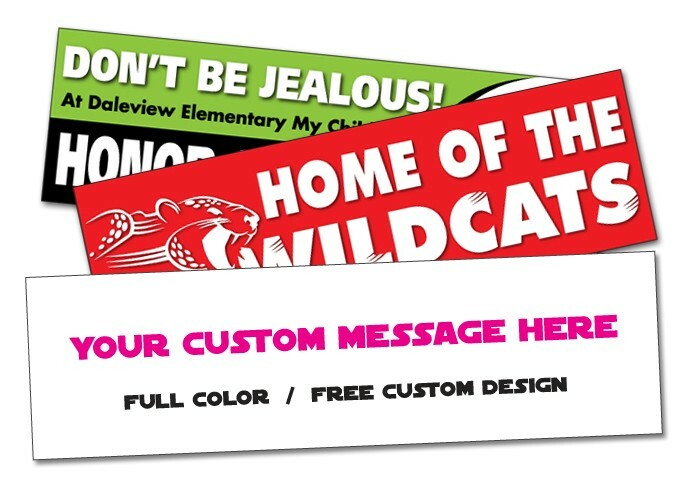 Get the most bang for your buck with our economy 2.5x8.625 inch rectangle removable bumper stickers. Our removable stickers are perfect for cars, trucks, vans, motorcycles...any vehicle. Stick them on the bumper, directly on the paint, windows, anywhere. Since they are removable, the stickers can be peeled off without any residue or causing any damage. Our stickers are printed in vibrant full color/four color process, are UV coated to prevent fading, and made from durable vinyl, so they work great indoors or outdoors. Even though they are removable, you can still power wash directly over the stickers without worry of them peeling or coming off…they are very sticky, but also can easily be removed, making them way more likely to be used by your patrons/customers compared to permanent stickers.